1 ½ cup mashed bananas (about 5 medium bananas). 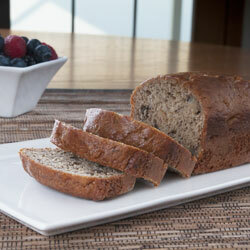 Extra-ripe bananas or previously frozen bananas can be used for a more intense banana flavor. Combine flour, baking soda and salt in a medium-sized bowl. Put sugar, butter and olive oil into a large bowl and beat with an electric mixture until well blended. Add eggs one at a time beating well after each addition. Add mashed bananas and yogurt then beat until well blended. Add flour mixture and beat at low speed just until blended. Pour batter into a 9 x 4 x 4-inch loaf pan, which has been generously greased (oil or non-stick cooking spray can be used) and floured to prevent sticking. Bake at 350°F for 60 to 65 minutes or until toothpick inserted into the center comes out clean. Let stand in pan about 5 minutes. Remove from pan and cool completely on wire cooling rack. Nutrition: Each serving provides approximately: 200 calories, 5 g protein, 35 g carbohydrates, 3 g fiber, 5 g fat (2 g saturated), 35 mg cholesterol, 10 mcg folate (DFE), 1 mg iron, 210 mg sodium. Nutrition: (includes chocolate chips): Each serving provides approximately: 282 calories, 4 g protein, 45 g carbohydrates, 1 g fiber, 10 g fat (3 g saturated), 39 mg cholesterol, 40 mcg folate, 1 mg iron, 190 mg sodium.